Screencasting is a great way to create presentations, enhance classroom lessons, make video how-to guides or to review apps and games on YouTube. If you have a Mac, you don't need expensive software to get started. The Mac has all the tools you need to capture your iPad's screen and record a video of it. Before we get started, we'll need to make sure you are on the current version of the Mac's OS. At the very minimum, you must be running Mac OS X Yosemite, which contains the updated software needed to capture your iPad's screen for free. You can check your Mac's version by clicking the Apple logo in the top-left corner of the screen and choosing "About This Mac" from the menu. Starting with Yosemite, the QuickTime Player on the Mac has the ability to capture the screen of your iOS devices. This includes both the iPhone and the iPad. You can even choose between using the sound coming from the iPad, which is useful if you plan to record a voice-over later, or skip the iPad sound and record a voice-over using the internal microphone on the Mac. First, connect your iPad to your Mac using a Lightning or 30-pin connector, depending on which model of iPad you are using. This is the connector that comes with the iPad. Next, launch the QuickTime Player. 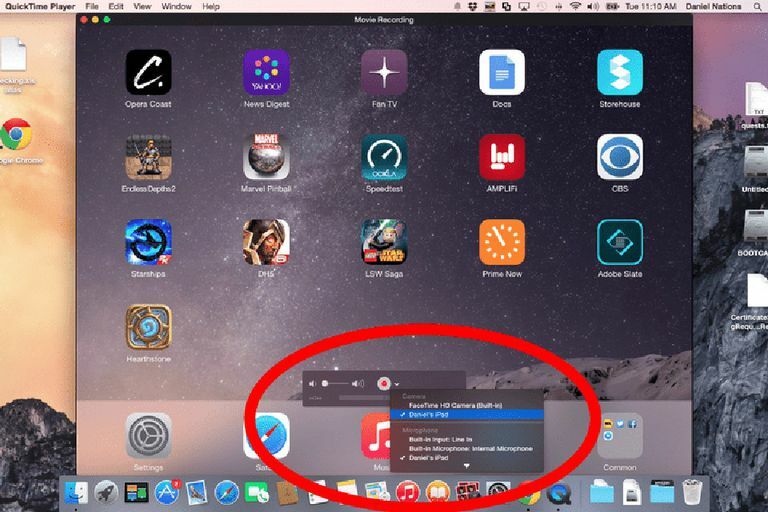 The easiest way to do this is to click LaunchPad and search for QuickTime. Click on File and choose "New Movie Recording". If you don't see this option, make sure the QuickTime Player is the active application on your Mac by clicking on it. When you launch a new movie recording, there is a control panel toward the bottom of the recording. This control panel includes a large gray or white circle with a smaller red circle in the middle. This is the record button. Just to the right of the record button is a drop-down button. Click this button to choose the source of the video. If your iPad is connected to your Mac, you should see your iPad as a choice for the Camera. If you don't see your iPad as a choice, make sure your iPad is firmly connected to the Mac and you have "trusted" the Mac. You can check this by launching iTunes. If your Mac isn't trusted, it should prompt you whether or not to trust the Mac. Below the Camera choice is the choice for Microphone. You can choose to use the "Built-In Microphone" if you plan on doing a voiceover as you record. Changing this to your iPad will record all sounds as well as video. You can also use an external microphone hooked up to your Mac by choosing the Line In option. When you are ready to start recording, tap the record button. While recording, this button transforms into a stop button, allowing you to end your video. Unfortunately, there aren't any easy options to capture your iPad's screen for free using Windows. However, there are a few choices you can use that don't cost too much money. In order to record the video, you need to get your iPad's screen onto your Windows PC. You can accomplish this by using AirPlay. Two good packages to allow you to use AirPlay are Reflector and AirServer. They are both around $15 and include a free trial period, so you can find out how well they work. AirPlay Server and Reflector include the ability to record the video received via AirPlay, so you won't need any additional software to capture the video.